Last night, in lieu of normal bedtime activities (reading Winnie-the-Pooh, Justice League I-Can-Read books, or our new favorite, Bone), Kaylee and Sean and I played some Hero Kids. For those of you unfamiliar, this is an RPG specifically designed for “kids from ages 4 to 10” – says so right on the tin cover. It’s been on my radar for some time, but I hadn’t done anything with it (including read it), partly because Kaylee and I have been entirely happy playing Fate [^And, in fact, I need to write up our most recent game using that system], and partly because I (incorrectly) thought it was some sort of “Pathfinder Lite” set of rules, which I had absolutely no interest in. Luckily, after running across a few good actual play reports, I gave it a proper read-through, and decided it might be just the thing for getting Sean involved in our games. 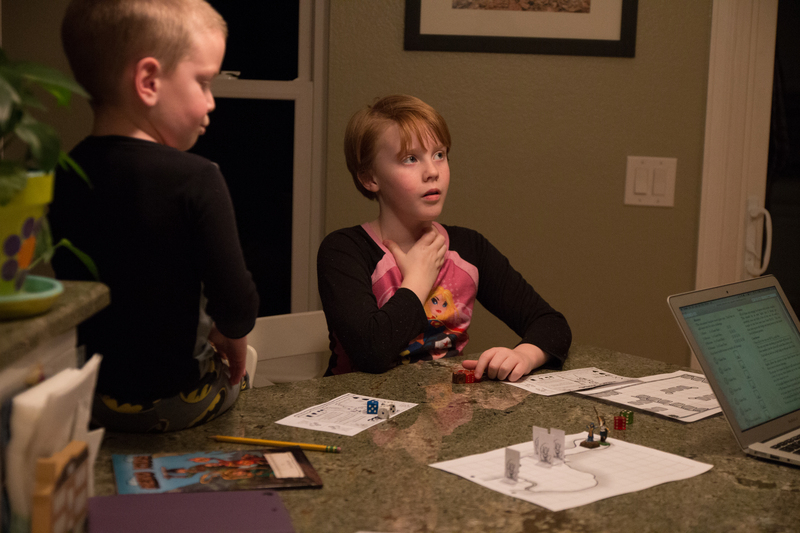 This isn’t to say we’ve never done RPG-like stuff with Sean before – we’ve had quite a bit of fun with his Imaginex DC Heroes figures and a superhero hack of a game Cory Doctorow made up for his daughter. The trick of color coding the dice (so that a d12 is “the purple one” not “the d12”) and simply rolling and reporting the number worked out pretty well. Epic battle in a makeshift downtown. But that option didn’t provide much story – it was really just a way for Dad to muck up otherwise frictionless superhero make-believe. I wanted something with a little – just a little – more oomph, but at the same time it had to pass the four-year-old test. 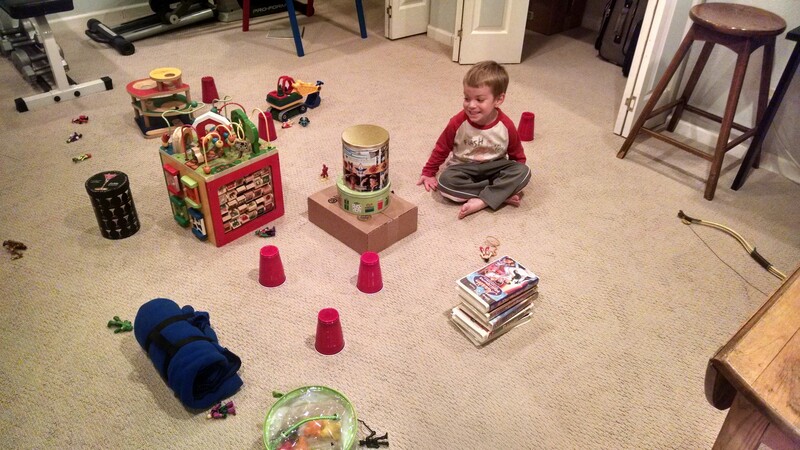 Intuitive directly correlates to A Four Year Old Can Manage It, Without Help. 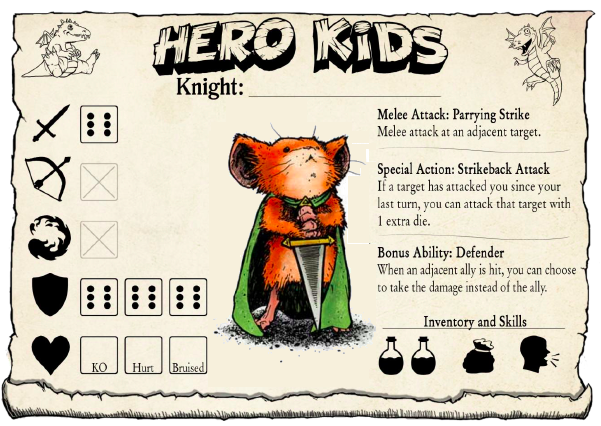 By this guideline, Hero Kids is the most intuitive dice mechanic in any RPG I’m aware of. You roll a few six sided dice and find the biggest single result. Done. No counting successes Shadowrun/Vampire/Mouseguard style (which, while not beyond him, is marginally more complicated than “find the biggest number you rolled on a single die”). The level of complexity a player deals with increases in direct proportion to how much of the character sheet they understand. If they can’t read yet, they just focus on the icons and art, and the rest falls away. And, not for nothing, the rules can easily be reskinned into a light version of damn near anything. Kaylee put together a very passable Hulk-like character for “super hero kids” in about four minutes. The premise for the Hero Kids setting is wonderfully simple: all the Hero Kids live in a small town that would be idyllic, if you ignore the fact the place is constantly threatened by calamities both great and small. 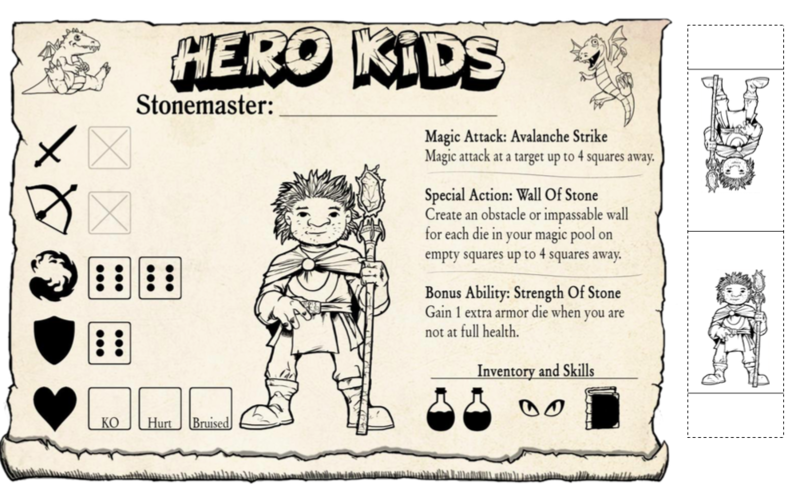 The kid’s parents are (in general) adventurers of the first water, and often called away for big problems, elsewhere, so it falls to the kids (who’ve been getting adventurer training since they were out of diapers) to deal with any troubles at home. 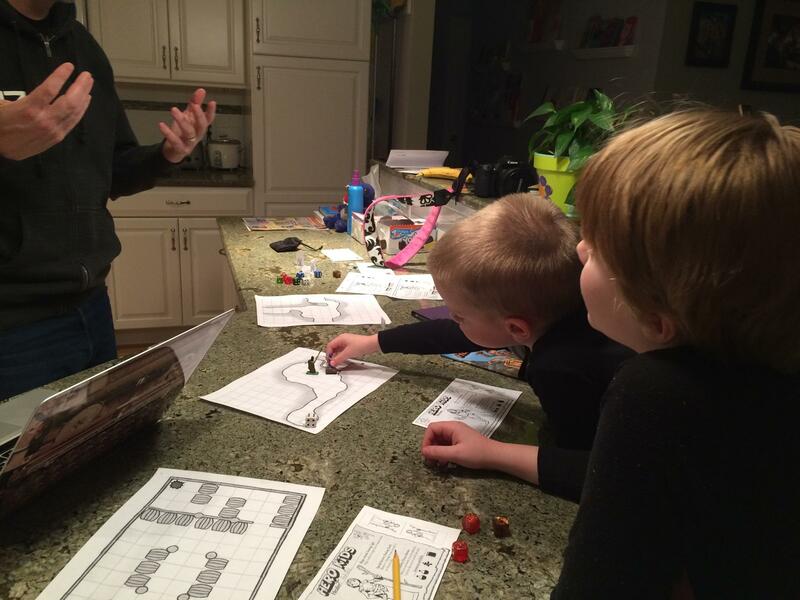 As the game started, the two player characters (Swerver and Ashlee, a water/ice wizard and healer, respectively) are enjoying their weekly family dinner at the town’s tavern (the kid’s decided their characters were sisters). There’s a crash in the kitchen, and the owner of the inn runs out, shouting that some HUGE rats just abducted her son Roger from right out of the kitchen. The girls look at their parents, who cluck their tongues disapprovingly and murmur something like “Mmm. That’s too bad,” and return to their creamed corn. The kids look at their parents, each other, then exchange the very highest of high fives and race each other to the kitchen. What followed was a (predictable, if you’re a jaded old gamer, but amazing if you’re them) descent into the inn’s basement, thence into a warren of tunnels beneath the inn, fighting a series of skirmishes with giant rats until finally facing off with the King Rat. I’m not going to describe the whole thing, but I am going to hit some of the highlights. Kaylee both picking a healer and maneuvering her character to take more of the damage to ‘cover’ her little brother. Best big sister ever. Kaylee leading them into a ‘side cavern’ away from the main plot, and using her “searing light” as a way to see into series of stalagmites in which she could dimly make out… something. Turned out that “something” was four lost villagers, which she and her sister then freed and sent back out of the caves. Awesome. The one rat who escaped every fight and kept retreating until he was finally beaten during the boss fight. Sean spotting the King Rat paper miniature sitting by my notes and trying to convince me to bring him in during every. single. fight. we did. The look on their faces when the rats in the last room used rat-sized tunnels to basically teleport around the edge of the room and sneak up on them. The high-fives when King Rat went down. Sean taking the King Rat paper mini with him, to bed. This morning, seconds after he woke up, Sean came into the kitchen. So… yeah. It was a pretty good game.